A rock band consisting of electromechanical instruments that makes music by throwing rocks through the air, slapping them and making them vibrate. The project by Los Angeles-based artist Neil Mendoza is controlled by a computer running a MIDI player while playing Here Comes the Sun, a biographical song describing the daily experience of a rock sitting on the ground. Pinger fires small rocks at aluminium keys using solenoids. Spinner launches magnetic rocks, Hematite, at pieces of marble. 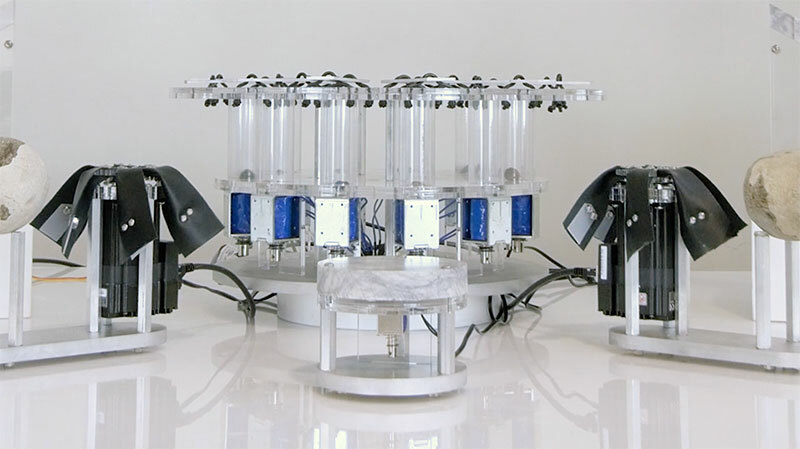 Rocks are launched by spinning magnets using Applied Motion stepper motors. Slapper slaps rocks with fake leather. Buzzer vibrates the plunger or a solenoid against a piece of marble. A rock band consisting of electromechanical instruments that makes music by throwing rocks through the air, slapping them and making them vibrate.